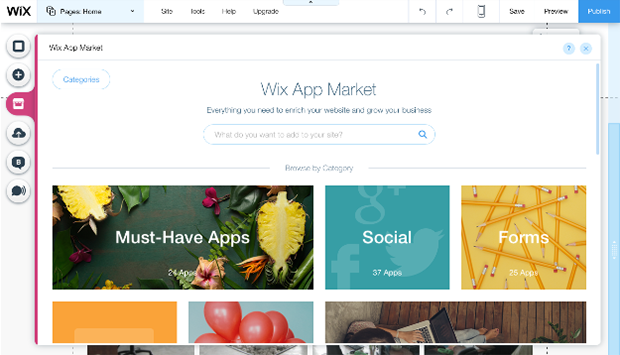 Founded in 2006, Wix has become a wildly popular web builder for people who revel in a ton of design options—without breaking the bank. In 2012, Wix switched from Adobe Flash to HTML5, a successful move that gained them, at the time, 25 million users. Their business model is freemium and we can immediately hear some people rolling their eyes. However, is that sign of “oh, no, not again” or the judgment is too early? You be the judge. 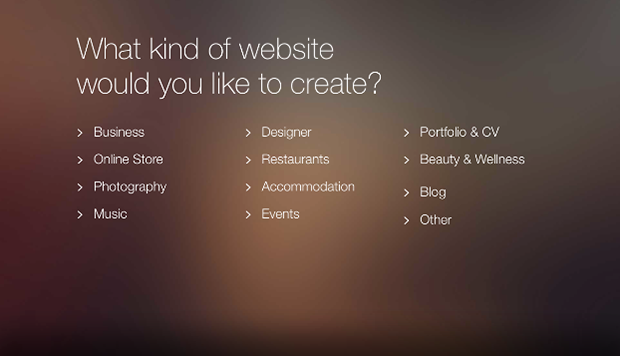 Open the Wix homepage and, if you aren’t already a customer, you’ll immediately be asked, “What kind of website would you like to create?”. You’ll be given a number of options that will become more specialized as you proceed through their process. Next, you’ll be asked to choose a template. Only at this point will you be asked to sign up. 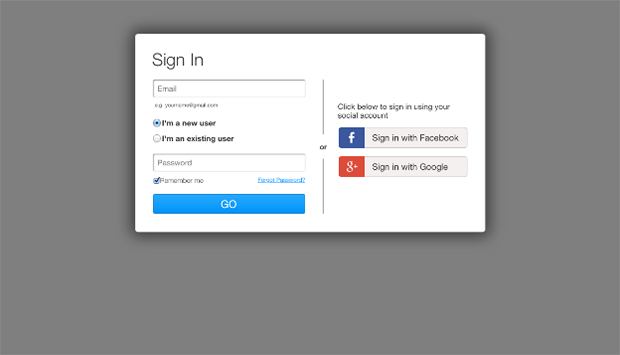 You can sign up with Facebook, Google+ or email and after a short video presentation, you will be transferred to the website editor. Easy-peasy. However, you will automatically be signed up for a Free Plan. If you want more, you can upgrade to Connect Domain, Combo, Unlimited, eCommerce and VIP plan (latter only available in U.S and Canada). You‘ll automatically be assigned a free domain: yourusername.wix.com/yourwebsitename. Not very professional—and a nightmare to remember and enter in a search bar. If you want to connect an existing domain, you’ll have to upgrade to at least the Connect Domain plan. If you don’t have a domain, you can buy it from them or get it for free if you upgrade to Combo plan or higher. When we get all this introductory stuff aside, using the editor is pretty easy. Everything is drag and drop, and you won’t have much trouble using it. Wix does have a few extra elements that will allow you to fiddle with parameters which are reminiscent of the word processors of yore. That’s not a bad thing, although if you aren’t careful, it can become crowded. Of course, more money buys more options. With the Free plan, you will cover all the basics. However, upgrading to Connect Domain enables you to use your own domain. We recommend upgrading to Combo, because you also will be rid of their native advertisements. Adding to the confusion is the fact that Wix calls all paid plans Premium plans. So, when the company says a feature is included in a Premium plan, you can’t be sure which plan they’re talking about. We already mentioned removing the native advertising and adding your own domain, but as the plans grow, so do the bandwidth and storage allotment. You also get more features, such as customized favicons, Google Analytics and an online store. However, the store is only included in the most expensive plans—e-commerce and VIP (which are not available outside U.S. and Canada). We especially like the Wix App Market. There you will find hundreds of apps that are readily available to you, including apps for an online store. You can install a PayPal button, eBay Commerce, Etsy Shop or an Online Store that allows you to get a free small shop, which you can upgrade. Of course for a fee. There are apps that are free, paid or with a free trial. Oh, the editor, what a beauty! It looks like a modern WYSWIG drag and drop merged with all the best features of a word processor. The learning curve is short and the best thing, if you do screw up something, you can undo it—or redo it. When you want to change an element, all you have to do is click on it and a pop-up menu will appear with several options, depending on what the element can do. We found the “animate” option quite interesting. Elements automatically snap to grid, so there’s no problem with overlapping. There is also a toolbar on the right, which you can move anywhere for a bit. The toolbar can get in the way, but when you remove it you may have trouble finding it again (it’s under the Tools button on top of your editor). The editor is fairly minimalistic. On the top of the screen, you will see a menu bar with a few of the basics. 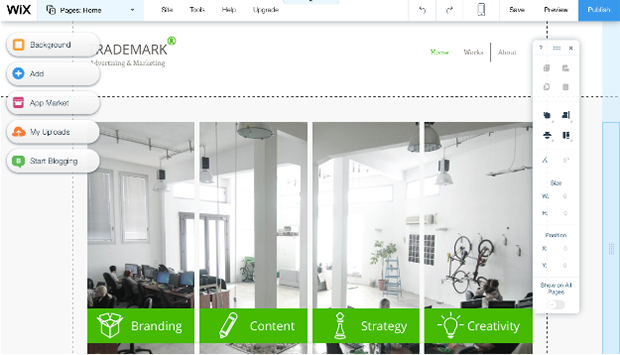 On the left of the bar is a drop-down menu for pages, followed by buttons for Site, Tools, Help and Upgrade. While the last three are self-explanatory, Site duplicates several things that are available in the editor, like Settings, History, exiting the editor or going to your Dashboard. On the right side of the bar, you will see symbols for undo, redo and mobile editor, as well as buttons for Save, Preview and Publish. Don’t overlook a tiny button in the top middle of the bar that hides all the controls. It’s a neat option because, when you get used to the editor, this will allow you to get rid of some of the clutter. But let’s not forget about six important, vertically aligned buttons on the left side of the editor. Page Background, Add, Wix App Market, My Uploads, Blog and Promote. We really like My Uploads because it hides a lot of options for images (and some free Wix ones!). Under the Promote button, you can send your customers stylish ShoutOuts (a.k.a. email templates for newsletters). But the real beauty is the Wix App Market. Neatly categorized, the apps are searchable—and there are a lot of them, free, with the free trial or paid. Their descriptions are detailed and there are even reviews by users, so you will never be able to say that their depicts weren’t clear enough. We would like to see Wix put the Site Settings on the first page of the editor. Currently, it’s located under Site button on the bar, but there are a lot of details like SEO, Mobile, Social or Analytics that require two clicks instead of one with the current layout. The dashboard has all of these items, and more, on the first page and some more, but wouldn’t it be nice to have them available in the editor too? Another drawback is that there is no native email. You will be given the option of purchasing email capabilities from Google Apps, an arrangement that’s becoming more and more common, but that involves additional steps. Wix is known for its abundance of templates. 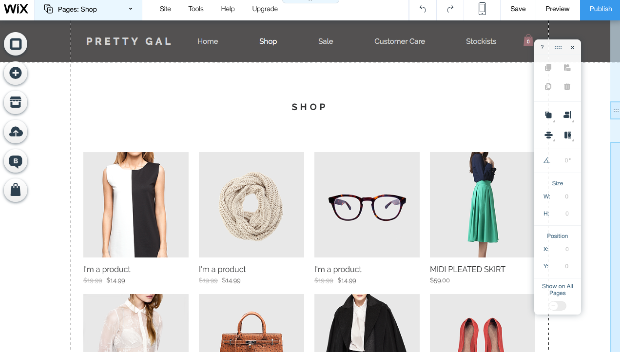 In fact, there are over 400 modern, fresh templates for you to salivate over both free and e-commerce. E-commerce templates include extra premium features that require an upgrade to work. You will be warned if you try to use a premium feature, such as an e-commerce shopping cart. The good news is that the templates are responsive (kinda), which means they are already mobile-ready and you can easily switch to mobile editor view and tweak them there. This sort of design and editor view is used more and more, however, we hope to see it in the mainstream. On the downside, once you select a template, if you want to switch, you’ll need to redo all of your content and there is no option for tweaking HTML or CSS codes, which will be irksome to more advanced users. There is a trick to the Wix online stores. Although you will be able to create your store, even with the free plan, the only way you can accept customer payments is to upgrade to eCommerce plan. Sure, there are apps in App Market that will allow you to accept alternative methods of payment, but this has a bait-and-switch taint. Additionally, there is no way to sell digital goods, which feels kind of…odd. Although managing the store is easy and the designs are appealing, the game playing aspects to paying for various capabilities left us with a bad taste. SEO options are hidden in your website editor. You need to click on Site Button, then Site Settings to reach the SEO tab. There you can adjust header codes and meta tags, manage redirects and access an SEO Wizard that will help you improve your search engine ranking. Are you a fan of Google Analytics? Upgrade to any Premium plan and you will be able to integrate Google Analytics. Otherwise, there are no statistics. When you sign up, you will get free hosting and have the ability to add your own domain or buy a new one. Depending on the plan you choose, you may even get the domain free for the first year. However, there are no options for exporting your website, so if you want to retain your visual identity, you will either have to get down and dirty and build everything from scratch somewhere else, or remain with Wix. Although this practice isn’t unusual, it’s certainly frustrating. Wix and other web builders that have this policy may have to be more flexible in the future, to remain competitive in the marketplace. If you are in your dashboard, you will easily spot the Support button at the top of the page. 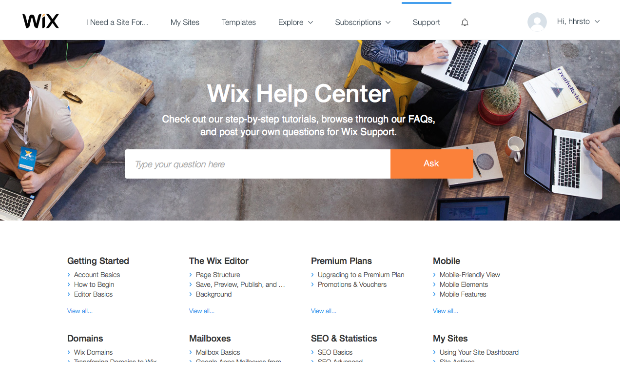 There you will be taken to Wix’s Help Center that has an extensive list of questions, categorized in many categories. They also have a YouTube channel with video tutorials and a user forum. At the bottom of the forum, you’ll see the Submit a Ticket button. Although they have phone support as an international customer, you will be disappointed with the lack of chat support. All in all, although their knowledge base and support are decent, navigating through them can be wonky, especially the first time, because not everything is in an obvious place. Wix has multiple plans, and that number depends on where you live because the last plan we’ll mention is only available in U.S and Canada. All paid plans are referred as Premium plans throughout the Wix website. Connect Domain, for $4.08 a month, allows you to connect your domain, 1GB bandwidth, ability to integrate Google Analytics and access premium support. Unlimited, for $12,42 a month, gives you unlimited bandwidth, 10 GB storage, form builder app and site booster app. eCommerce, for $16,17 a month, gives you 20 GB storage and most importantly an online store. VIP (U.S. and Canada exclusive), for $24.90 a month, will get you a VIP support line, which includes immediate response on forums, skipping the line, a one-time professional site review, and more. All prices are expressed with a yearly plan. Overall, Wix is a great tool for total beginners who have no idea how to build a website. The Wix team wants their customers to have a lot of options and sometimes it has left us feeling like parents that just got dropped dozens and dozens of “I made this myself” gifts from their kid. Yup, the intention is good but it can leave you a bit puzzled and confused on where is what or how to put a few things the right side up. But once you get the hang of it, you will be delighted with the options that it offers. We really like having the ability to animate images and to undo and redo actions. We are really sold on the abundance of attractive templates and the number of apps available at their App Market. 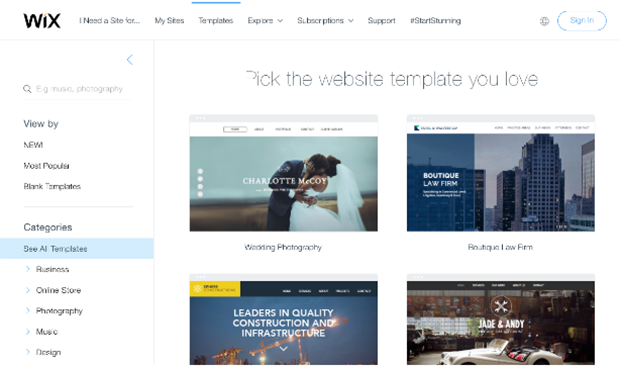 However, the e-commerce bait and switch, the absence of chat support and inflexibility when changing templates left us short of feeling that Wix is “the one” when choosing an ideal website builder. Does that mean you should avoid it? Hell, no! After all, you can start free and you don’t need previous website-building knowledge. We encourage you to test Wix out.